I loveeeeeeeee cooking, however, when it comes to breakfast time I'm actually really lazy. You see, I wake up of a morning, make Jesse breakfast and pack his lunch if it's a work day and by the time I'm finished that, my stomach is grumbling and all I want is breakfast, a cup of tea and bible time. That's why I always fall back on quick and easy breakfast options; breakfast bakes and overnight oats being my absolute favourite because the preparation is all done in advance! But it can't just be easy. I also want my breakfasts to be nutritious and delicious with a protein punch to give me energy for my busy day ahead. That's why Proats have been making a regular appearance in the SIL house. 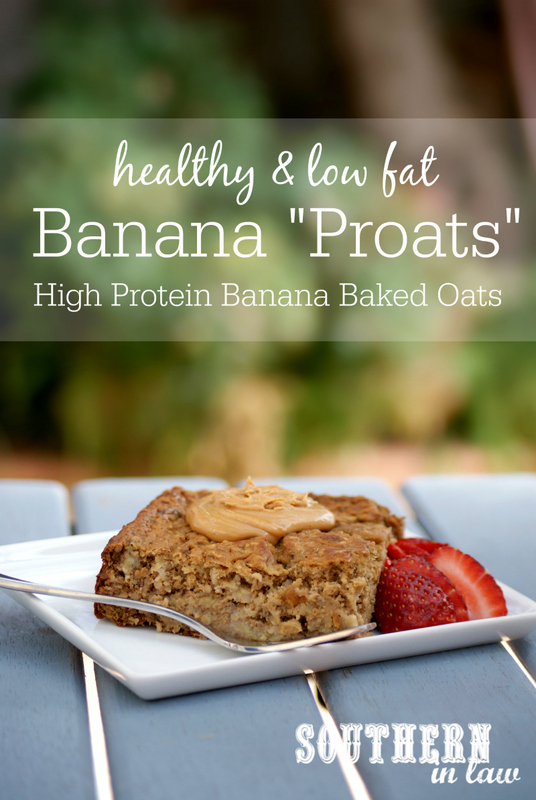 Proats? 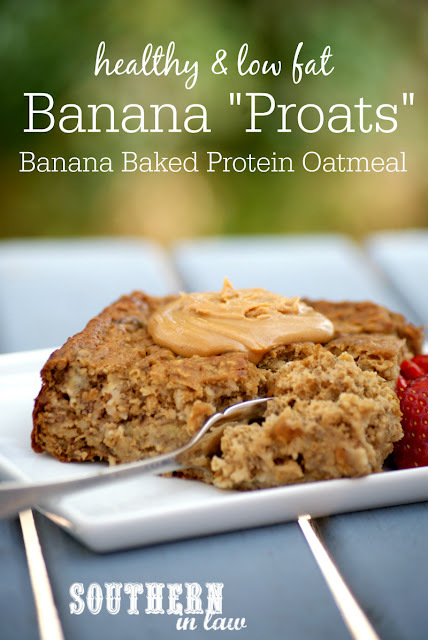 It's just short for protein oats and this Banana Baked Protein Oatmeal Recipe is our absolute favourite. 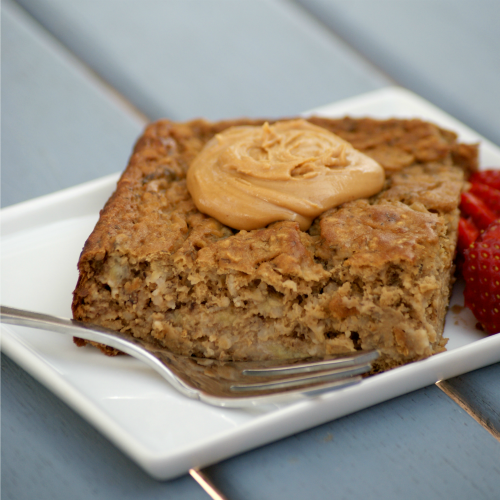 Packed with protein, whole grains and healthy fats; this protein baked oatmeal recipe is a complete breakfast that can be made in advance and even frozen for a quick breakfast treat. You can eat it on its own or do what I do and top it with a dollop of peanut butter for the ultimate breakfast. 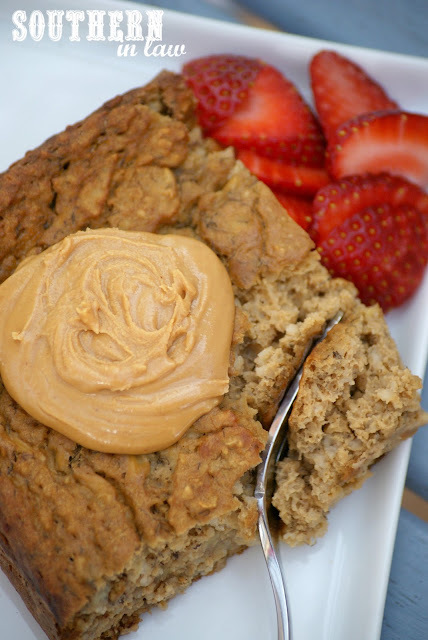 This recipe does use protein powder, however, you can also use peanut flour for a protein packed Peanut Butter and Banana Protein Baked Oatmeal instead! Once baked, allow to cool slightly before cutting and serving. I actually like mine cold so I usually pop the whole batch in the fridge once it's cool and then slice it in the morning. *Find out more about oats on a gluten free diet at http://www.southerninlaw.com/2013/06/are-oats-gluten-free-where-to-buy-gluten-free-oats-in-australia.html . If you can't tolerate oats you can replace them with quinoa flakes, however, the taste and texture will be different. **All protein powders differ in weight so be sure to measure by cup. If you like things really sweet, you may want to add some maple syrup or sugar into the recipe (but you may not need to do this if your protein powder is sweetened). If using a liquid sweetener, just take out an equal amount of the milk to account for it! But tell me, what's your favourite breakfast at the moment? Favorite breakfast is oatmeal mixed with quinoa flakes and topped with chocolate tahini! Mmmm now that sounds delish!